Home News Industry News Brownells Adds Ammo, Takes The Shopping Experience To The Next Level! Brownells proudly announces that the company will carry a full selection of quality, brand name ammunition making it, truly, the place for all of your gun needs. Brownells, a world-leading, Iowa based distributor of firearms accessories and gunsmithing tools carries rifle, handgun and shotgun ammunition from top manufacturers like Winchester, Federal, Remington, CCI, Hornady, Fiocchi, Ultramax, Kent, Weatherby and many more. Competitive retail pricing plus the qualifying Brownells dealer discount, quick shipping, and Brownells exclusive 100% guarantee and free expert tech help all still apply. Customers can load up all the goodies they need for their latest gun project, add ammo, and get it all conveniently shipped to their front door. Brownells exclusive 100% guarantee applies to all purchases so customers can rest easy knowing that they can return anything they’re not happy with – no questions, no hassles. Brownells exclusive Ammo Advisor™ is another industry first. 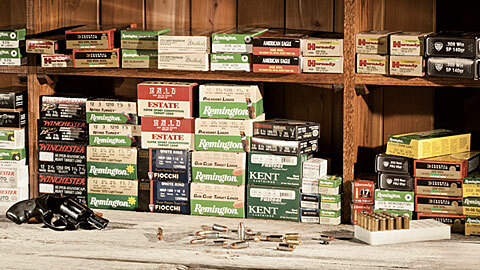 The new tool makes shopping for ammunition online quick and easy. New shooters can use the Ammo Advisor™ to help them figure out which ammo is right for each application. Experienced shooters can use it to help them see options they might not have considered. Use any or all of the fields and the Ammo Advisor™ filters the selection based on the shopper’s criteria. The selection fields are populated with all the top brands in the calibers shooters use most. Of course, customers can always just head straight for their favorite brands without going through the Ammo Advisor™. “65% of Brownells customers shoot more than 25 times per year, citing activities ranging from plinking to big game and varmint hunting. We are taking the ammo shopping experience to the next level by offering customers a tool that is user-friendly. It makes shopping for ammo quick, fun, easy and convenient,” continued Brownell. Everything you need to build, customize and now shoot firearms is available at brownells.com. At Brownells everything is guaranteed, period! …Forever, 100%, with no restocking fees. Founded in 1939, the company supplies more than 35,000 firearms parts, accessories, gunsmithing tools and ammunition to armorers, gunsmiths, and shooters worldwide. Brownells provides free tech help and there’s no minimum to order or small order fees. To place an order, or for more information, call 800-741-0015 or visit www.brownells.com and mention code PHR.